Stitches and Scissors: More blocks. This month is going to be crazy since I am in 3 Quilting Bee's for a total of 5 blocks to make! So I am trying to get them done as I get the fabrics so I don't have a big pile on my table starring at me, stressing me out! lol. I am a little nervous for one of the blocks this month. We are asked to make the spiderweb block that is so popular in Quilting Bee land, so I am trying to clear my to do list to work on that when I get the fabrics. This block was sent out by Viv from the Cottage Quilting Bee and she was doing and Emily the Strange quilt. 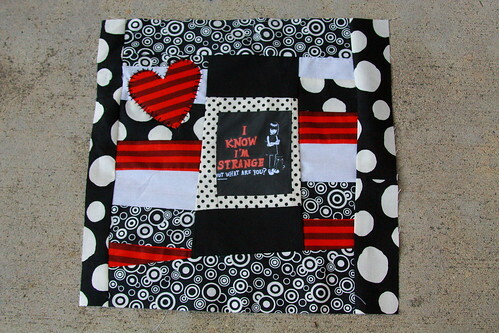 I added the polka dots on the outside of the block and the one around the Emily the strange picture. I love me some polka dots. I decided to add a heart to the block after I heard Viv ask people to make a heart block if they did not have a picture. 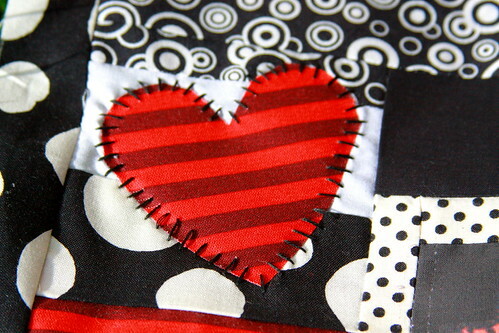 I did have a picture in my fabric scraps, but I still liked the idea of a heart so I tried out hand applique. I could not be happier with the turn-out, especially since it was my first time. It totally has a Nightmare Before Christmas feel to me. Then the next block was sent out from Stephanie from the Pieced Together Quilting Bee. She sent us out an ABC block and wanted us to make a log cabin and if we wanted to embroider the ABC block we could. Well you know me, I love to embroider so I was up for the challenge. 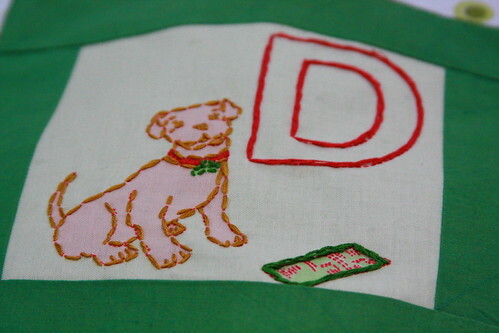 I added the white print with the green and pink circles,the green and pink plaid, and tiny bit of white to the block. It turns out that I got the D block and that was a very funny coincidence. I used all 6 threads of the embroidery floss so that it would cover up the lines on the fabric, but you can still see some of the lines and I was super annoyed with that part, but I am happy with the end result. Last, but not least, I joined a Doll Quilt swap over on Flickr. I am a little crazy, I know, but I can't help it, I love to sew. haha we brought you over to the dark side. I love your blocks! I have a hard time doing what you did with the log cabin block- unless they're exact sizes, I get all messed up. But they look like fun! I am freaking out with LOVE right now. I yelled at my husband who is sitting right beside me... LOOOK AT IT!!!! OMG that is for my quilt. OMG!!!! Okay I said that like a lot of times. 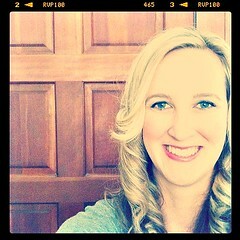 :) I am so excited!!! You are just awesome. I love the red placement in your block for Viv. It really brings the block to life. Great embroidery on the ABC block. I'm with you with the mounting bees and dqs6! I just can't say no! Best to try and stay ahead of the game. I just hope not all the fabrics arrive at once or my head might explode with ideas! I'm glad to see your PTQB block-- I've had a harder time than usual trying to get started on this one! I have the letter "V". 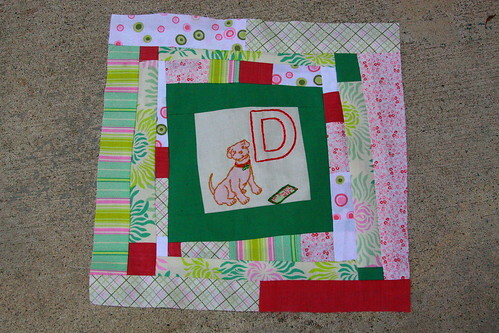 Oh, I love those blocks, the heart was a very nice touch, and I love the "D" block really cute!! I like the heart, cute! Your blocks are great! You have such fun ideas. I'm anxiously awaiting my fq's from Belgium (not to mention the chocolates). And keep me in mind if you need another "participant". You and Erin have me thinking and dreaming in fabric!